If there was a photo next to the word commanding in the dictionary, it would have a photo from tonight’s Game 4 against the Raptors. It would also show a picture of the Raptors laying down and watching the Wizards run over them in 125-94 commanding victory advancing to face either Brooklyn or Atlanta. 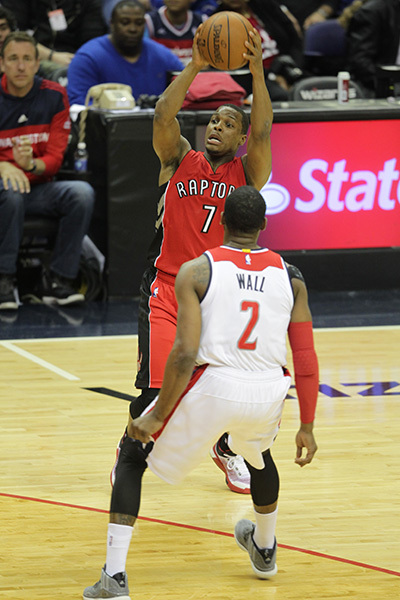 The Wizards finished off the Raptors in four games Sunday night to quickly close the first-round Eastern Conference series, getting 21 points and 11 rebounds from Marcin Gortat, and 14 points and 10 assists from John Wall. Six Wizards scored in double figures, including Bradley Beal with 23 points and Pierce with 14, and that duo made seven of the Wizards’ team playoff-record 15 3-pointers. On the other side of the ball Raptors Head Coach Duane Casey, complimented his guys, but said, “we are a young team and we have some work ahead of us. These guys played a really good basketball team and we will find ways to not just make it to the playoffs in the future. For the Wizards, the win tonight showcases what this team is capable of on any given night behind any given player. Wall commented on the entire team play and having a few days to relax and focus on the next round.